Elite Prospects.com: Reports Islander prospect Kim Johansson could be transfering to Kristianstads IK while former Islander-Sound Tiger Ryan Caldwell will be leaving the Coyotes AHL club in San Antonio to play for Düsseldorfer EG Metro Stars which Eurohockey.net confirms. European leagues start up very soon, the KHL will begin September 2nd. Newsday: Anthony Rieber in his Newsday blog decides to tell us about the Newsday/Cablevision ownership, how honest the paper and his blog will be but then tells us the Knicks are simply still not a good team, the Rangers still don't get enough bang for their buck but only the Isles are a laughingstock and we're going to keep writing it in Newsday in what he calls honest commentary until it's no longer true (in his view) or the club moves. Where I come from honesty is not a double-standard where it is selectively applied to your favorite teams and not all teams. Not too friendly from the only paper that is supposed to provide full-time coverage from Mr Rieber who only shows up to play the shock jock game on the Isles and insult them. So Mr Rieber wants us to buy from him under Cablevision we will receive honest coverage but then he tells us the Knicks are not a good team and does not throw the laughingstock label on them with a half a column about all the comical decisions they have made under his new boss? Did he write that with a Cablevision employee sitting next to him needing approval before it was posted like Alan Hahn and several writers needed approval from Msg security NY Observer before interviews with Knicks players last season? I guess that would not help Mr Rieber's job status writing the Knicks are far from simply a bad team but a disgrace and arguably one of the biggest laughingstocks in New York sports history thanks to his new boss. The Rangers with one cup since 1940 that have done virtually nothing more than the Isles in the postseason (and finished only two points ahead of the Isles a year ago with the Isles winning both season series) that spent ninety million on two centers who could not play on the first line are not a laughingstock after missing the playoff for seven years in a row while the Isles who have been to more playoffs in the last six years then both Msg franchises combined are a laughingstock? No folks, the Isles are hardly a good team at this time but things are not that bad either that they merit this constant assault from Newsday writers/bloggers. If they stayed healthy and got anything from their veterans they likely would have made their fifth playoff in six years even with the lack of scoring. It's hard to take coverage like that seriously in what reads like more like a Cablevision resume than what Mr Rieber calls honest coverage but Isles fans are used to this kind of poor treatment from a staff of writers who are not fans of this team who do not beat up any of the other clubs like this regardless of record and seemingly go out of their way. The Mets change managers the Isles take a beating from a Newsday writer. The paper changes hands the Isles take another beating from Mr Rieber. Isles make a coaching change Wallace Matthews jumps off baseball to bash the club. Al Arbour comes back, has a great night Jim Baumbach writes something negative. DiPietro starts the All-Star game our beat writer cannot be bothered blogging. Isles go to Newark Mr Herrmann talks about the clubs viability. Guest amateur writers blasting the club. It seems the only time Newsday can treat our team like a big market team is when it's time for someone to come out and insult them. No wonder a lot of our fans just tune the club out. You take this kind of unfair coverage too long you don't want to be bothered or just accept it. This is the paper that most of the North American media relies on for New York Islanders perception with the phrase according to Newsday attached to almost everything as a disclaimer. Only thing Mr Rieber does here is make himself look like a laughingstock with a double-standard in reporting that is disgraceful. CBC.ca: Report former Kings coach Marc Crawford will be joining Hockey Night in Canada next season with his comments. I guess Crawford can be taken off the Isles coaching list based on this or it will be a very short run at HNIC. Edmonton Oilers: Have announced Kevin Lowe has been promoted to President of Hockey Operations for the Edmonton Oilers and has named former Islander Steve Tambellini as the team’s new General Manager. So Jeff Tambellini's father is now an NHL general manager. He must have been on the outs in Vancouver to let him become gm of a rival team in the same division unless Lowe is what John Davidson is to St Louis with gm Larry Pleau basically a step below. Somewhere Brian Burke is either laughing or unhappy. Would not shock me if the new Oilers ownership is kicking Lowe upstairs too. National Post: Michael Traikos has Mats Sundin's agent, J.P Barry's comments on the saga to sign the long time Leaf. Mercifully the professional media sources have kept his name away from the Isles, perfect fit for the Rangers to sign another veteran declining for big money with a front-loaded Cablevision contract which will not make the local papers. I guess Roberto Luongo and twenty million is not enough to get his to sign in Vancouver. Canadian Press: Report unrestricted Philadelphia Flyers defenceman Jaroslav Modry signed a two-year contract with Czech club HC Liberec. Daily News: John Dellapina reports through Czech newspapers two time Ranger Peter Nedved will be invited to camp for a tryout. I'm surprised Messier did not call up already and try and to get his spot back for five million a year with the captaincy. Funny, I did not read about how old Nedved was compared to Doug Weight who must be fifty years old from some of the reports about him. Nedved for those wondering both players were born in 1971. Weight in January, Nedved in December. Holik is oldest of the three. Canadian Press/several sources: Report Scotty Bowman has agreed to become the senior advisor of hockey operations for the Chicago BlackHawks after six years with Detroit as a consultant, joining his son Stan who is the Blackhawks assistant GM. The Isles website reported Doug Weight will appear from the signed unrestricted free agent witness protection program and be on hand for Islander fans August 9th at the next team shareholders meeting as we finally get to hear something from him. Final poll results are in and in a late rush of votes, Gervais was voted the sixth defender over Freddy Meyer but many feel an injury will decide things. The poll started at a point before Gervais signed. I'm kind of glad I included the option on Berard which several felt could still happen. I guess we will see. It would be interesting after seven preseason games if everyone is healthy if one of these regular defenders are in the stands at New Jersey. Newsday: Greg Logan reports according to the infamous NHL source Joel Quenneville was committed to take a year off from coaching before the Isles' job opened up, but Garth Snow later followed through and contacted the former Avs coach, but in preliminary discussion he was not a good fit for the Islanders at this time. Mr Logan also report's Scott Gordon's interview went very well with Gerard Gallant scheduled this week and will speak with other canidates and that the preseason schedule will be released Thursday with the expected date for the Coliseum preseason game as October 1st against New Jersey. Boston on Sept. 23 at Moncton. Philadelphia on Sept. 25 at London, Ontario. Florida on Sept. 27 in Summerside, Prince Edward Island. New Jersey on October 1st, Nassau Coliseum, New York. New Jersey on October 3rd, Prudential Center. At Florida on Oct. 6. Unless Garth Snow has some interviews no one knows about it should be down to Gallant and Marc Crawford before we see some second interviews or an outright hiring. No big surprise Quenneville did not want to coach in the Eastern Conference for the first time. Cannot recall the Isles going that far south for a preseason game much less one that late. According to this they play in Florida and then come back to play the Devils in New Jersey to open the season? It would be something different if they opened down there and played a game in Florida. NHL.com: Dan Rosen has an article on the Canadian Prospect Camp in Ottawa with comments from coach Benoit Groulx he now knows who Travis Hamonic is as the Isles prospect is featured in the article with a picture. Mr Rosen always does quality work on the club and did last weekends update. I hope he does the August 5th update where the Isles prospects are scheduled for review and goes to team USA camp. Star Tribune: Michael Russo has a few words from Mark Parrish today upon being placed on waivers by the Minnesota Wild. Later today it was reported the former Islander cleared waivers and was bought out so he is not a free agent here. No fit for Mark Parrish on this roster. Career right wing with Hunter, Guerin and Okposo in front of him a a slew of competition for the fourth line center and right wing spot. Columbus Dispatch: Aaron Portzline reports by the third year of goaltender Pascal LeClaire's new contract he will be making more than Rick DiPietro at 4.8m. Greg Logan in Newsday's Islander blog here tells us the pre-season schedule will be released later this week and that Scott Gordon will be interviewing today. Funny, I did not read Steve Zipay's print article titled no Islander appetizers? To quote Bill Guerin earlier last season give it a rest with the Rangers, write about the Isles. Mr Logan starts by telling us were are not playing the Rangers and then does a paragraph about last year's brawl? More updates depending on what's happening and more of the same as we go through a ton of negative preseason expectation articles presented by the usual suspects in the media along with team USA camp updates on the prospects as we get closer to training camp. I will be taking vacation and a few days off here and there from blogging. Of course full coverage when a coach is finally hired which is when I will finally schedule a live blog and chat so look for one scheduled next week or the week after when Garth Snow makes his decision. I read in Newsday today they will shortly decide whether to make the on-line paper a pay subscription site like their TV News site. If that happens my work load will decrease because I am not paying Cablevision for the margial coverage we receive to post their mediocre at best content whether it be Greg Logan or another writer. Anyone who thinks Islander coverage will increase I'm afraid would be kidding themselves or wishful thinking at best. This is company that got Islander televsion rights years ago almost immediately took their games off television while during the summer we see virtually nothing in terms of Islander content while the house team is practically spammed all over Msg. Our team could not even get it's full share of the Hummer Metro Ice challenge without a fight and even then got only half. The writers will do as they are told or go find another job. Regarding this blog I already do my own summary of games, the Isles can provide the quotes along with the AP and out of town coverage with ITV. It's up to the Islanders to bring the coverage to us and to work something out with Newsday and the other papers or provide their own writers for summaries and quotes. The Long Island theme to practically everything they release sure has made it very easy for editors in other papers to decrease coverage. This blog will not be paying anyone to post full copyrighted material. The format changed during last season to provide a link with a summary of an article and will stay with that format. Funny thing is Cablevision promises they will have a disclaimer next to coverage of their sports teams in the paper which is a joke because the Rangers should not be covered at all in Newsday for the same reasons city editors are finding excuses not to provide full time coverage of the New York Islanders. Of course we know that is not going to be the case, I'm afraid anyone who sees a Cablevision owned Newsday as an increase in Islander coverage only need to turn on Msg Network to see how much more one team will receive than the others. Sporting News: Craig Custance reports former Islander Mark Parrish has been placed on waivers by the Minnesota Wild. The veteran forward signed a five-year deal worth $2.65 per year in 2006. Boy that group that left here after the lockout has fallen far, I cannot see another club claiming Parrish at that price unless it's a team well below the cap. Of course the same Islander fans crying we want a plan will say bring him back because they do not understand that means Okposo would be locked out of a right wing spot with Guerin, Hunter as the other right wings unless you want to kick Park off the team for him to play on the fourth line? Scatchard got a four year contract, was traded, bought out and is finished. Peca is reduced to one year contract for low salary in Columbus. Aucoin spent most of two years on IR in Chicago before being traded. Hamrlik got a lot more money than his play merits for Calgary or Montreal. Zhitnik was bought out of Atlanta and is trying out in Russia. I have no idea if anyone has bothered with Sopel yet after he's moved around. Updated: Chicago gave Sopel a three year contract in season. Bates looks like it's almost over. Weinhandl is out of the NHL. Jonsson is back in Europe. No one wanted Niinimaa and he is back in Europe. Czerkawski just announced his retirement. Mike York just limped to a two-way contract with Columbus after several stops. Anyone else I miss? DiPietro, Hunter, Martinek, Gervais, Campoli remain. This is why your core youth have to replace what you lose. Espn.com: Scott Burnside decided to bring his gloom and doom to sunny Florida today in an attempt to prove even teams that build with prospects can fail miserably on the ice and be at the crossroads with this players leaving when they get the chance. HockeyCanada.ca: Canadian Junior Prospect Camp reports Islander prospect Mark Katic assisted on the opening goal for team Red in Tuesday's Red-White game Jared Spurgeon had a second period penalty. Team red won Tuesday's final game 4-2. John Rolfe sent me another e-mail today which I added to the earlier thread where he also looked at SI perspective. Great stuff from someone who clearly is a long-time fan and again I thank him for taking the time to respond. Norwalk Plus: Has a release on the Islanders announcing Matthew Bertani is the new assistant coach of the Bridgeport Sound Tigers, who will join head coach Jack Capuano and assistant coach Pat Bingham, assisting in video analysis for the upcoming 2008-09 AHL season with comments from Mr Bertani and Sound Tigers President Howard Saffan. Ct Post: Michael Fornabaio in the Sound Tigers blog has a few words on the hiring along with Sound Tigers website. Miami Herald: George Richard reports in the Panthers blog defenseman Jay Bouwmeester signed a one year contract today avoiding arbitration but could be moving on sooner or later if a long-term contract cannot get done or he does not like the Panthers direction. Only if he agrees to a long-term contract with the Isles before a trade should Garth Snow have interest. Bouwmeester is going to want to pick and choose sooner or later, it may be Florida but maybe not. Islander prospect Jared Spurgeon scored the final goal in the Red teams 4-3 loss on Monday at the Canadian prospect camp. Corey Trivino has a second period penalty for team red here. You read some of the speculation on why some coaches would be a good fit here vs those who would not be a good fit here and I kind of laugh at most of it. Unless someone who worked with these people in those places comments about what outright skills or flaws they had it's virtually worthless in terms of today or the Isles of 2008-09. Every team and it's circumstances are different and things change a lot. Unless we are behind the scenes working with these people on a daily basis we really have little idea of anything. Al Arbour came here in 1974 after leaving the St Louis Blues where he coached and helped build a club with prospects into a dynasty, second time when he came back for Terry Simpson it took a lot of growing pains and the club never really became a good team for a sustained period with a lot of playoff misses or mediocre clubs that only played well in stretches. Al Arbour did not turn many prospects into star players in his second tenure as coach, however Vladimir Malakhov or Darius Kasparaitis were never better. Of course if Arbour were looking for a job today we would be reading he can only take playoff teams to the next level and is not good for a rebuilding. You can put the actors to the name, Gerard Gallant can play the role of Eli Wallach for this one. 1. Scott Gordon-For those who will do the Steve Stirling analogies that would be a huge mistake given age difference despite the amazing job Stirling did in the NHL as a rookie coach with an injured Isles team after a great job in Bridgeport. Scott Gordon has been an outstanding coach in the AHL with Providence as an assistant coach first who almost was named Bruins head coach last summer who is well regarded in the organization with many saying he is more than ready for an NHL head coaching job and would be a great fit as an NHL head coach. He can work well with prospects obviously but can he work well with veterans would be my question. It should be noted he was Mike Sullivan's assistant coach with Providence before before Sullivan was promoted to the Bruins coaching job. Goaltenders generally do not have great track records as NHL head coaches (at least recently) for what that is worth but goaltenders do bond well which could be a big plus to our goaltender turned general manager. It should be noted one of the star players on the team Scott Gordon took over in 03was current Islander Andy Hilbert who also played for Mike Sullivan and no doubt he has plenty of experience with Ben Walter. 2. Mike Sullivan-Not a lot to write here, he was promoted from Providence with little coaching experience in the AHL and was the youngest coach in the NHL at the time of his hiring guiding the Bruins to a playoff spot his first season. GM Mike O'Connell decided not to retain many veterans during the lockout that wiped out the 2004-05 season so at the end of 05-06 with the club struggling he was fired by new gm Peter Chiarelli who brought in Dave Lewis who fared no better. Sullivan was left waiting as replacements for his job were being interviewed by Boston. John Tortorella feels Sullivan is an excellent assistant as Sullivan moved on to Tampa Bay who was part of a Stanley Cup and has endorsed him many times as being more than ready to be head coach of another club. 3. Paul Maurice-I know a lot of folks will point to his cup run with Carolina but that team only had eighty three points in 2002 (thirteen behind the Isles) and were given third seed because they won the division. I know the word is he works well with prospects and gets along well with general managers (Jim Rutherford is one of the best) but what team has Paul Maurice ever made good for an extended amount of time? Since the Hurricanes' appeared in the 2002 Stanley Cup finals, their record had been horrendous with the club winning only seventeen games out of eighty before he was fired in season. His Leafs tenure was an outright failure which of course had more to do with his general manager's choice of players. Sure he could be hired here and do a great job, but on paper this does not seem like a good hire. The relocation to Greensboro from Hartford bought him time, so did the Canes moving into it's permanent home as did the cup finals run before time finally ran out for him. 4. John Tortorella-This is a coach who had been with one club for a long time who has basically seen it all in his first full-time assignment. He has coached superstars, developed players into stars, won a Stanley Cup, finished 30th while pushing his clubs for all they can give and more with sometimes burning his clubs out as they fell apart or looked over matched come playoff time. He took a Tampa team that had done virtually nothing (aside from one playoff run) it it's history and turned them into a winner. Most of his players liked playing for him, he never had any public problems with former GM Jay Feaster and his reputation of being a troublemaker seems more of a media creation because he gives colorful interviews. There were no complaints from Brad Lukowich or Ruslan Fedotenko about Tortorella when they signed here, despite Fedotenko's poor final season in Tampa where he was dropped on the third line. If Charles Wang, Garth Snow and John Tortorella are all willing to take the growing pains, the criticism and buck the second year trend of head coaches around here and work in the prospects and stick with the plan, it's the right hire. Given some of the outright strange moves by Tampa's new ownership keeping it's gm in limbo and bullying a player just signed off the roster, I'm inclined to see the club hire Tortorella as long as he can accept there will be no Martin St Louis or Vinnie LeCavalier on his first line come October. If Mr Botta is correct that DiPietro and Tortorella know and like one another that does not hurt. He's also a big name coach for a team that desperate needs a bigger media presence and should fit right in with the club reaching out to the community. 5. Bob Hartley-If relationship with the gm here is the over-riding factor than the Isles might as well schedule the press conference. Hartley was one if not the lone outsider who endorsed Snow's hiring as general manager in 2006. Of course it will not be only about that but about track record and Hartley is another coach who has basically seen it all from Stanley Cups and amazing success in Colorado to struggling clubs rebuilding in Atlanta he did take to the next level, he's worn out his welcomes and comes well respected by many others. Will he buy into a youth movement here or did the playoff meltdown carry over or did Don Waddell's shortsighted moves catch up with him or did Hartley push for the short-sighted moves? Either way the situation was so poor in Atlanta on a team with many talented offensive players he was gone after six games but left Atlanta as the most successful coach in team history who got a very quick hook last season. Hartley's presence did not keep Heatley in Atlanta for what that is worth and never got Lehtonen to the next level with a defense less than adequate that always played an offensive style. This is a man who never played an NHL game for those wondering. 6. Joel Quenneville-Hard to argue with Quenneville's record as a great choice for a head coach other than that he has only taken his clubs to one conference final but is another who has long experience who is well respected but after a while organizations make changes because a coach took his club as far as management felt he could. How would he deal with a club that could miss the playoffs for years given he only had one spring without a playoff. Ted Nolan did not react well, how will Quenneville with the adversity losing can bring? Fair to say Quenneville has had some fantastic talents, including Doug Weight during his career. He seemingly has never been part of a franchise with a lot of prospects competing for spots and has never coached in this conference. 7. Marc Crawford-A lot of long experience, a Stanley Cup in Colorado and helped turn around the Canucks with four playoff appearances but the message does grow old and coaches burn out teams and Crawford is that kind of coach. Like Quenneville has never coached in this conference but was brought into Los Angeles for a prospect team that struggled for two year and was fired by the general manager who hired him which has to raise questions for Garth Snow who did not have close to the franchise talents Crawford had with Los Angeles despite many young players producing well under this coach. Gerard Gallant-This will likely be the least popular choice among Islander fans because of how poorly the Isles powerplay performed combined with his dismissal from Columbus, but Gallant like many Jacket coaches (including Ken Hitchcock) still has not had the right core of talent around him where he had a fair chance to show his abilities and was with Columbus for six years. He could not make it work as coach with Anson Carter and the addition of Fredrik Modin in a trade, or with Rick Nash. Gallant took over for Doug MacLean midway through the 2003-04 season and finished with a 16-24-5 record. After the lockout the Blue Jackets went 35-43-4 in 05-06 but went 23-16-2 in the second half of the season after Nash returned from an injury but opened 5-9-1-0 when he was fired in November of 2006. One thing for sure he will not be getting a star like Nash here nor did he get more out of Carter, Fedorov, Modin. Was his animated confrontation with former Islander Marc-Andre Bergeron be taken as a positive or negative? Newsday: Greg Logan has an article on the coaching search that confirms what Mr Botta wrote in his blog with Mike Sullivan and Scott Gordon up next for interviews with more on the time table for a hire. It's always funny reading some of these things. Team source, league source, it sure would nice if one time a writer said the name of that source because it's not as if this is some kind of major secret these men are interviewing. Imagine if we had known in April of 2006, Garth Snow interviewed for the Isles general manager position, that's one all the sources missed completely so the media never got a chance to put that out there for the public. Calgary Herald: Bruce Dowbiggin describers Bob Hartley as the perfect coach for the Isles because he is a fake coach for a fake team. The Stanley Cup ring on Mr Hartley's finger sure is not fake. For me Isles are a little fake right now especially Garth Snow for saying his relationship with Nolan was fine as he would be critical on one hand with performance and then say he wants to keep things a family and behind closed doors with the other, cannot have it both ways. Learn the words no comment or be less accessible to the media. We have general managers in this league (and in New York sports) who are in the witness protection program when it comes to speaking to the media. Garth Snow has no obligation to speak with Newsday or any media outlet unless there is something to report. Hockey Canada.com: Has a recap of Sunday's game at the Canadian prospect camp in Ottawa. Another game will take place Monday at 6pm with camp concluding on Tuesday. Come on folks, you know that plan. It's one folks sure were not complaining about in the summer of 2002 when they were buying tickets and will be thrilled with for a few months. So lets get to work, go sign Glen Murray, call up Okposo's agent and tell him there is no spot for him and were looking to trade him to win now, no doubt San Jose will be happy to give up Patrick Marleau for a year before he goes unrestricted. Now that we have Marleau for a few months we no longer need Nielsen, Colliton so lets get one of them out of here for Mathieu Schneider and put a second round pick into the deal as one of our infamous sweeteners. No room for Jeff Tambellini, let's package him with Campoli with another second rounder and get Jason Blake back in here so Islander fans can boo him every night. Of course that means we have to add McCabe because the defense is terrible. Bergenheim or Comeau with Gervais should make that happen with Leaf fans dancing in the streets. Guarantee there is someone who just read this and said that could be a good team. So let's just get Milbury back in here and start giving away young players for aging veterans so the team can be trapped in mediocrity forever. When all these veterans all start breaking down or getting hurt it will be a heck of a four month plan. There is still a first rounder and Josh Bailey to move at the trade deadline to keep things going. The best out of Marcinko, Figren and Joensuu should make for a great trade deadline rental. I almost cannot blame Mike Milbury back in those days, one day he would be told he could finally spend and the next was told cut the budget. You honestly think you would not do the same or be worried about your replacement winning in a job you would never have kept if you went with youth for another five plus years with no guarantee of success? Funny, but doing this just only enhances how stacked this team is with quality prospects moving forward and how good they have every chance to become if they stick with what they are doing if they avoid the Milbury plan at all cost. coach gets the latest nomination for the early Jack Adams. I guess the rest of the so-called experts can keep telling Milbury stories while the Isles keep winning. Boston Globe: Fluto Shinzawa speculates about Scott Gordon-Garth Snow and that he would be a very good choice by the Isles and cites the usual NHL source for a quote that reports Snow wants someone to grow their youth. The Republican: Fran Sypek's headline writer tells us Scott Gordon is a leading candidate for the Isles head coaching job while the writer tells us Gordon did an excellent job molding young Boston Bruins prospects into NHL-ready players. So this is how it works, do a headline title Gordon a front-runner with no quotes from anyone because he is brought in for an interview? Calgary Herald: Scott Cruickshank has an article on Duane Sutter which includes a few stories about Brent Sutter from his Islander days. NY Post: Larry Brooks tells us why Bryan Trottier, Butch Goring among others should be hired as the new Islanders head coach and that candidates like Tortorella and Hartley will not work because they want to win now. Just more proof how out of touch Larry Brooks is with the current Isles given Trots already said he is not interested which just makes this a waste of an article unless Butch Goring is added to the interview list. I do not think anyone has told the Isles yet they will not be competitive next season given how they were in a playoff spot for a good part of last season until injuries hit it's hard to see them not being in contention again if any of these prospects can give them anything in terms of consistent scoring. 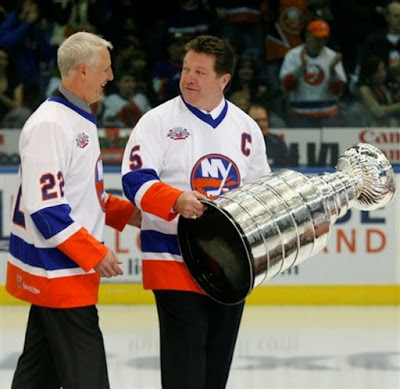 Larry Brooks should know first-hand Trottier was sabotaged by Mark Messier who refused to let the club picked a new captain or take the fourth line role he wanted for Messier at his press conference. Given the Rangers returned to the playoffs as soon as Messier's leadership retired (without naming any captain) no doubt Trottier was correct, even if he would never win the media game against Messier's sportswriters which was also his undoing because they could never accept a former Islander dynasty player as their head coach. Larry Brooks I have a feeling wants no part of John Tortorella in this market showing him up in press conferences, a former Ranger interim coach they let get away who won a championship. NY Times finally tells us Mike York did not sign in Russia despite reporting he had and listed his transfer on their website begging the question why are there mistakes being made which also had misleading reports on a few other players signing? They cover more hockey in Europe than in New York with their media writers/bloggers and cannot even get this correct for us? We saw this with Sergei Brylin also. NHL.com: Dan Rosen has an article on the league high five Islanders at Canada's National Junior Team Development with comments from assistant general manager Ryan Jankowski, Josh Bailey, Cory Trivino, Mark Katic. Travis Hamonic and Jared Spurgeon. My thanks to Adam for providing me the link so I could put it here for everyone. The video interview with Josh Bailey is from his draft night. John Rolfe of SI responded to my e-mail, I thought I would share his response with my blog readers and give you my follow up e-mail to him. Agree or disagree I respect Mr Rolfe for responding and thank him for his effort. who talk a good game. bizarre than most, at times anyway. I really appreciate your taking the time to write in. Mr Rolfe, Thank you for responding. First off you should know New York Islander Fan Central is a blog that covers our team through long experience going back before this team won it's first Stanley Cup in 1980, as far back as games in 1975 when they played on Wor channel nine in New York. No blog works harder in the search for facts and truth whether positive or negative, but only asks that what is reported is fair. The only thing that is coming from Mr Muir or Mr Farber is more of what you just did or Scott Burnside/Adam Proteau. These people could not go ten deep on the Isles current roster without it in front of them which is the problem. We never get the x or o from these writers just more of what you just did. I have seen this article from you once a year, usually when something goes wrong and always you admit to loving the club and being a fan. I have to ask what's so bad about a club that has made it to the playoffs in four of the last six years? Compare this to Florida, Phoenix, Chicago, Toronto, the Rangers who have done nothing that the Isles did not do when they returned to the playoffs and a ton of clubs like Nashville or Columbus/Atlanta/St Louis, Los Angeles that have won virtually nothing. Tampa just fired a cup winning coach for a broadcaster, kept it's gm in moth balls for a draft and free agency before sending him packing and thretended Dan Boyle out of town off a new long-term contract where he ripped the franchise. Did they sign so many players no one noticed? Meanwhile everyone signed here or resigned with virtually no problem at some very good contracts including Hunter for five years and Witt for three years at below market value. Dean Lombardi went to Los Angeles and just fired his first choice as coach the same year Snow and Nolan were hired. Lou Lamoriello fires coaches in first place in March, Colorado just fired Joel Quenneville to bring back Tony Granato. Brett Hull has as much experience as Garth Snow going in. I don't know if Mr Wang falls prey to guys who talk a good game, if he did he would be far from alone. You really think Charles Wang wanted all this negative press, to pay Nolan 600k to stay home and pay a new coach on top of it? Even worse Nolan for what Wang did for him according to Chris Botta had problems with his veterans, with his prospects and did everything to act like a selfish man, some of those newsday reports by Greg Logan had a lot of mistakes and by the time other media outlets interpreted the story things just became even worse with more skewed fiction from fact. Garth Snow according to Mr Botta is operating on the same one year contract Nolan was and had not been given an extension either, who gives any coach longer term than it's gm? Of course the jury is still out on Snow but he's locked up the youth and has given them a spot on this roster. The plan Mike Milbury did not see through. Like Florida it could fail miserably but unlike Milbury's plan there is more than Mattias Weinhandl behind the current plan with a lot of first and second rounders who have been waiting since 2003. The last twenty years have little to do with the last six. A period where this club had the fourth best turnaround in NHL history in 2002 and made the playoffs three other times, you cannot gloss over that and even note the Rangers have turned a corner but not the Isles or it's not a consistent standard. I never have ANY problem with my favorite team being criticized but for me it has to be for the correct reasons or it comes off as unfair or from a viewpoint that lacks knowledge or just wants to pile on. The Rangers for eight years lost with double the Isles payroll with a ton of dissention and problems and did not take this kind of beating in the media, same for a lot of other franchises in this league that have struggled far worse than the Isles. Just one other thing. The Isles since summer 2006 have never done better in free agency in the clubs history. Not in the eighties, nineties or in the years they had Yashin, Peca. Something folks in the media have not noted at all. I really appreciate your taking the time to write back. I hope you consider some of what I have written here, it's time for a new angle, one that reflects 2008-09. And thanks for your thoughtful response. You make a lot of great points. I can't speak for the other writers although I can say the Islanders saga has attracted a certain consistently negative media attention because of its duration and occasionally bizarre turns which make it a more widely compelling dryspell story -- and it is New York where foul-ups, bleeps and blunders quickly get the spotlight (see: the Yankees, Mets and especially Knicks). From time to time, our writers have looked at other franchises -- Jim Kelley frequently takes the Maple Leafs to task for their incompetence and Al Muir has gotten after the Blackhawks and Bruins, although not to the extent of putting a photo gallery together. As for me, having experienced a dynasty as well as a team that went deeper than the first round of the playoffs with some regularity, I feel a certain frustration at the Islanders' ability to get untracked and stay untracked. That same feeling is shared by my younger Isles fan colleague in our photo department. Each change of ownership brought hope of better things that never materialized. After the great turnaround under Laviolette, the momentum was quickly lost, as it was with Nolan. Yeah, it's kneejerk thinking and the here-we-go-again story is getting old. I agree it's time to focus on the future and I'll be sure to have Al Muir who whoever does our team previews give an evenhanded assessment of the team's on-ice talent and prospects. I appreciate your comments and our dialogue. St Pete Times: Damian Cristodero blogs on what John Tortorella would bring to the Isles with the potential upside and downside. SI.com: John Rolfe is his mail bag responds to the latest negative article on the Isles who got a few tough comments from some fans. Two things caught my attention here. One was when Mr Rolfe wrote he is a life long Islanders fan because it was something I have known because he does include that part every year when he does this kind of article but does not excuse his lack of articles on the current Isles. Second was when he took what to me is a double-standard noting the Rangers have turned things around because they have made the playoffs three years in a row while ignoring the Isles did this also and made it four of six years. If Mr Rolfe's standard's for turning it around somewhat is making the playoffs three years in a row than the Isles qualify and it's time for his to seperate the past from the present. I can appreciate the fact he is an Islander fan and frustrated at the club but that still means he has to be consistent with his standards for all teams. I sent him an e-mail and asked why the double-standard and how come he does not note all the kids in Garth Snow's plan which is far different than Mike Milbury's plan and how come he's not telling us more about them which is what our fans need a lot more of with a lot less nineties history? National Post/several sources: Report former Islander Mike York has signed with the Columbus Blue Jackets. Anyone else see a little payback for the hardball with Filatov's being suspended or is Columbus trying to become very old and slow down the middle with York and Peca unless York plays left wing? Ct Post: Michael Fornabaio reports in the Sound Tigers Ct Post blog Matt Keith has signed a one-year contract with ERC Ingolstadt. Just one time, go conventional with the uniform above if a decision has not been made on a third jersey. For once no re-inventing the wheel. I can accept building with prospects, taking time to improve and most anything. What I cannot accept is a new generation of fans throwing lighthouse's, bars that have never represented anything but John Pickett, John Spano, the gang of Four and Howard Milstein (who gave us those bars) on the latest incarnation of our incredible uniform and tradition any longer which frankly looks terrible and as poor an idea as the orange jersey. Just one time go conservative, after introducing one of the above designs as the third jersey scrap the current uniform and bring it back full time next year. And leave it that way for good. You will sell a ton of jerseys and the large majority of the fans will love it. On the core of the Four Weekend you brought back the Lake Placid patch so someone does know the history in detail. This team has all the tradition of a club that was around when hockey began in this country as a professional sport before 1926 when the NY Americans established the pro hockey tradition for all others to follow. No US based hockey team had a longer or greater dynasty, no team in pro sports history won that many playoff series in a row, that uniform stands for something special that other clubs never did and a symbol of excellence. 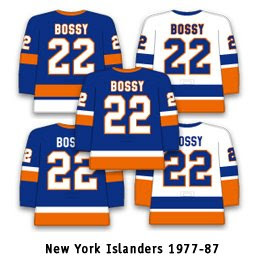 To me the Islanders and all these uniform chances since Bill Torrey left town is like changing the Montreal Canadians or Yankees uniform. Just one time play it conservative. I guarantee it will go over huge and make a lot of money. Most importantly it's the right thing for this franchise, the only thing for me. Newsday: Greg Logan reports John Tortorella will meet with Garth Snow this Sunday as the beatwriter makes comparisons between Tampa Bay and the Islanders and also reports Mike Sullivan and Scott Gordon are expected to interview next week. Tortorella is an interesting choice but he has had a lot more talent to work with on offense in Tampa. By contrast he will have a lot of talent on defense and in goal if he is hired here. Garth Snow has no time for vacation and has a lot of interviews to go through, he may need some second or third interviews before a decision is arrived at. Newsday: Greg Logan reports in the Islanders Newsday blog defenseman Bruno Gervais has been resigned to a three year/one way contract at a bit more than 2.1 million. At the conclusion of this contract he will still be a restricted free agent. His first-year salary equals his qualifying offer of $522,500 but will receive $800,000 and $900,000 in the next two seasons. Islanders website: Has general manager Garth Snow's comments on the signing. Great signing but it does mean seven defenders are signed for at least the next two seasons. That finishes up contract negotiations with all restricted free agents and no distractions in terms of player contracts before camp. Someone with a contract will not be happy opening night if everyone is healthy. For those voting in the poll we can eliminate Gervais will not be signed. Times & Transcript: Cole Hobson has Moncton Mayor Ian Fowler's comments on the 9/23 exhibition game against Boston. More details surrounding the camp, public activities and open practices will be released at a later date. Long Island Business News: Henry E. Powderly II has an interview with new Dragons majority owner Steve Silva with a few words about Charles Wang and negotiations. Daily Graphic: Has an interview with former Islander Aarom Asham who talks about his time with the Devils and why he signed with Philadelphia. appearing on Espn, I think this is a repeat from THN. How come Espn does not have enough hockey writers? The days of a staff of writers like Al Morganti seems long gone for Espn leaving us with the Scott Burnside, E.J Hradek or Teri Frei perspective. Not to kick around the Isles TV staff because they did a great job on mini-camp putting up prospect interviews in bulk and obviously need to get this months version done early in the month but the Isles Illustrated needed to do more than throw in a very quick blurb on Ted Nolan not returning even if it was only Bill Jaffe's video comments last week. By the looks of this some brief prospect camp footage was included but it looked like it was held for the August version. So what is that now, forty shows a week on Msg Ranger centric and nineteen minutes of quality Islander content? Who padlocked the vault of games for the Islanders on Msg + this summer? I know I would not mind seeing Al Arbour night a few times or all those Ranger or Devils wins. InsideCal.com: Los Angeles Kings writer Rich Hammond had defenseman Jack Johnson's comments the Coliseum area and the rink was the worst in the league a few days ago in a long interview. Which should be forwared immediately to town of Hempstead's Kate Murray and Smg. The Islanders may not have a coach yet but at some point whoever is hired has a very tough decision coming. Going under the presumption Witt, Streit, Martinek, Sutton and Campoli all with the kind of contracts that can only be traded I though it would be a good poll if you decide who should be the sixth defender vs who should sit and wait for a chance? If we all remember last season began with nine defenders after Berard signed, but that group included Meyer, Johnson with Bergeron/Berard juggled depending on who was playing better or injured. No Bridgeport option for any of these players without waivers. Needless to write this is a different group than a year ago with a signed Freddy Meyer who had a very strong second half, Bruno Gervais who when healthy has rarely sat a game. It also has to be noted Garth Snow was in the mix for Dan Boyle so obviously he may be looking for a front line defender or someone who complements Mark Streit on the powerplay. Jack Hillen/Dustin Kohn have an AHL option so they will not be included in this poll. Islanders website: Reports the second installment of Islanders Illustrated will debut Thursday at 7:30pm on Msg plus. Boston Herald: Steve Conroy reports the Boston Bruins have placed forward Glen Murray on waivers. If Murray clears waivers today, starting tomorrow the Bruins will have 48 hours to complete the buyout. Can the Isles claim Murray given how NHL waivers work? Sure. Having written that where do you want to play a career right wing on a team with Guerin, Okposo and Hunter in your top three unless you want to keep Okposo in Bridgeport next season or give Murray your fourth line right wing slot and say goodbye to Richard Park? Thenewpl.com: Reports former Islander Mariusz Czerkawski has announced his retirement. Ct Post: Michael Fornabaio in his Sound Tigers blog notes Matthew Spiller is now listed as being with the Devils. Finally Happy One Year Anniversary to New York Islander Fan Central and my thanks to all the readers of this blog on a fantastic first year. Newsday: Greg Logan in the Islanders Newsday blog reports according to a league source Bob Hartley will be interviewing with general manager Garh Snow on Wednesday with some speculation about his upside and downside if he were hired. NY Post: Mark Everson reports Larry Robinson will not be returning as an assistant coach to Brent Sutter with the Devils with Lou Lamoriello telling the writer Robinson will revert to his previous post as a special assignment coach. 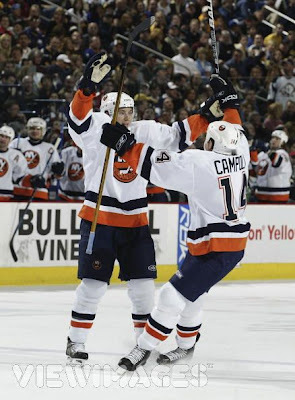 Sault Star: Randy Russo in more of a weekly sports recap article has one question about the Isles changing coaches and asks going back to Buffalo who is the common denominator when it comes to these circumstances? Same article also reports 19-year old centre Anthony Perdicaro, has been invited to the Prospects Camp of the NHL's New York Islanders but not clear if that is a future camp or the one that just concluded? This is the paper that had Ted Nolan's comments back on 5/2 who's editorial blasted the Isles and Charles Wang/Garth Snow a few days ago. I sent the writer an e-mail with my own questions last week but have not received a response. It's interesting reading so many pile on the Islanders in the general hockey media but a common thread for me stood out on the coverage that really makes me dismiss almost all of. Whether it's positive or negative means little but all they could do is provide background wallpaper that goes back a decade or longer and has no value regarding today's club whatsoever. This is a disconnect that can be attributed to not only dwindling coverage but dwindling quality in terms of reporting. In terms of 2008-09 and Snow-Nolan deciding they did not want to work together any longer all of that is completely worthless. Some of the articles were so poorly written they could not even remember that Neil Smith was fired and incorrectly reported Smith resigned. If they cannot even get the background wallpaper correct obviously they can give us nothing of value in terms of the current club. A good example of this media disconnect was clearly evident during the season when a lot of West Coast writers finally got to see the club for the first time this year in their markets since 2002. Some have never even seen Rick DiPietro play a game in those time zones. Had Rick DiPietro even seen Calgary since 1999 when he was drafted? It was one of the first times a few of these writers could update their files for a decade. But of course this disconnect goes well beyond the West Coast. What is Wallace Matthews of Newsday going to tell our fans about the New York Islanders writing one article every few years at best? John Rolfe of SI, Adam Proteau of THN, Scott Burnside of Espn could tell us nothing new that they have not been writing for years. It seems a few of them are trapped in the club's past. You could see it in Scott Burnside's reporting all year. All he could tell us was he did not expect the club to stay in contention just as he did the previous year and played it safe keeping his updates about the past. This year even confirmed local writers like Larry Brooks who covered Al Arbour night from an Islander perspective or Dave Caldwell at the Times/Peter Botte at the News were simply not around nearly enough to provide us anything new of value. Peter Botte was nowhere to be found, he did not touch any of this. Snow because he came in a backup goalie as they threw half-baked theories against the walls hoping it would stick, many blamed Charles Wang but had nothing current as to his role or anything beyond blind speculation. Few blamed the timing and for waiting so long which is where the only legitimate criticism should be here. Most of these writers could not name ten players on the current roster, they can only tell us the roster back in the late nineties or when the Isles signed Yashin or that Charles Wang fired Neil Smith two summers ago. You can see it in the work how they avoided the current roster at all cost or wrote the club does not have great prospects or only told us Doug Weight is old while ignoring Bobby Holik of the Devils is older and has been less productive over several years. It's like me trying to do a blog about the Phoenix Coyotes and go back to when they were in Winnipeg to point out their mistake and go off when Blake Wheeler would not sign with them. I can do a little filler and provide the downside why they have struggled for a long time but in terms of current information I would do a very poor job. That's what has happened here. Of course when the games begin and the Islanders are competitive they have nothing to write because there is no comfort for them in current events. We saw that a lot the last few years just as we saw teams copy some of the Isles ideas and the media downplayed the long-term contracts or shared management strategy in Dallas to almost silence from the media. Bottom line most of the media providing these reports do not know anything new and just rehash alot of old things because it was the only place these people found comfort in their work. Most fans following knew the committee philosophy was a bit overblown and downplayed for most of the last two years, Mr Botta wrote about this a few times during the season. It's kind of like how we see some writers portray the Black Hawks as a team on the rise or the Blues despite two teams that to date have not won anything and in the Blues case finished behind New York. No knock on these clubs because that could be true but it could also be true for the Isles. For folks who remember that press conference a few years ago Charles Wang even said if a committee approach did not work out it would be scrapped and they would and back to the way it was. Along the way that is exactly what happened and for all we know it began shortly after the next season began to a degree. The general manager/assistant gm, pro scouting got the players, a year ago the coach had input, but once the games began the coach had his job and the general manager had his which both Garth Snow and Ted Nolan confirmed in their now infamous WFAN interviews back in March which everyone seemed to ignore in the media. But hey, Roberto Luongo was traded in 1999, Alexei Yashin was signed to a long-term contract, that must be the reason things are dysfunctional now even though a lot of clubs changed coaches. Los Angeles hired Dean Lombardi as general manager and just fired his first coaching choice in Marc Crawford who was hired the same summer Ted Nolan and Garth Snow were hired. Tampa fired it's cup winning coach for an Espn commentator and left it's acting gm home for the draft and free agency and the same media people did not have much if anything about it. Are the Isles going to be a good or bad team next year? We'll see. Is it going to have anything to do with 1999, Roberto Luongo or Charles Wang firing Neil Smith two years ago? No. Until those writers get beyond that nothing to read of value from them. Having written that the 2007-08 New York Islanders scored two goals or less fourteen games in a row when healthy and managed to not only stay in contention with a strategy that did not get enough games to overtime or shootouts that produced a team deep in the red in terms of plus/minus (unlike the previous season) but one where they were close to five games over five hundred until the flu and injuries pushed them out of the mix in January only to recover and win six straight without some key players later on. Even with four hundred man games lost to injury they still managed to beat the Devils, Rangers and play competitive hockey with Pittsburgh. The Isles special teams seemed to beat themselves against Philadelphia a lot more than the Flyers all season. A lot of what if going into next season for the club but if Comeau, Bergenheim keep improving in terms of numbers, Okposo can replace/improve Satan's nightly impact with Tambellini finally bringing his AHL production to the NHL level and the club getting a good bounce back year from Hunter (in terms of goals) Mike Sillinger and newly acquired Doug Weight with a little better from Comrie and Guerin there is no reason this club will not be in position to compete for a playoff spot regardless of who is behind the bench. Nielsen, Colliton and Ben Walter will be pushing for spots along with Jesse Joensuu and perhaps Josh Bailey if some moves happen to open a spot. On defense they are going to be counting on Campoli to provide Mark Streit with some powerplay production but overall this defense comes in only better than they were a year ago with Sutton, Meyer settled into roles after very strong finishes for both of them. Witt and Martinek should pick up where they left off when healthy with Bruno Gervais a possible seventh defender given the depth chart and Jack Hillen behind that with Dustin Kohn coming into his second pro season. Why would anything think losing Ted Nolan, Josef Vasick, Miroslav Satan or Ruslan Fedotenko cause a free fall? Charles Wang and Garth Snow could leave tomorrow and still this could be a competitive club depending on how things break. This was a group that cut down it's shots against down last season by a hundred and ninety eight which did not make it into those reports about Todd Bertuzzi, Roberto Luongo or Neil Smith nor did Greg Logan even note in his constant reports DiPietro had to start less games. Rick DiPietro aside from his grandmother's passing gave the club solid goaltending from beginning to end last season, despite a statistical argument put forward by Newsday he was struggling, ignoring a six game winning streak highlighted by a 1-0 win against Tampa Bay. We'll see what happens when the season begins, the idea it will have anything to do with Mike Milbury, Todd Bertuzzi, Neil Smith or Alexei Yashin will have more to do with a lot of writers out of touch when it comes to the New York Islanders as opposed to what's happening on the ice in 2008-09 trapped in the past or poor coverage habits that are their problems, not ours. And of course you will see more of the same in pre-season predictions, what the heck is John Rolfe of SI going to tell us about the 2008-09 Islanders? We get one of those articles every year from Mr Rolfe regardless of record and will until the Isles win another cup. He was quick to quote Richard Pilon's take on ownership but ignored how grossly out of shape Pilon was which is why he could not play until he went to the Rangers and dropped some pounds when it was clear he was playing for his future, he cannot put that on Howard Milstein nor can John Rolfe. When that happens you can bet the day the Isles do win another cup for folks like Mr Rolfe the theme will be all about the dark days, only place he can go with his reporting now because it's all he wants to know. They can try and blame Charles Wang for that too but in the end many of them have to take a long look in the mirror and ask why are they not watching games to give us a 2008 view on the current club? If they do a review of the club and tell us Bergenheim cannot finish, Comeau is not a scorer and Okposo is too young that's fair enough, could well be correct. They want to tell us Campoli cannot stay healthy, the defense has too many players prone to injury that's a fair discussion also. But don't tell us it's because of moves close to a decade old, that's just lazy journalism. Our fans deserve better from you. One thing for sure, some very tough decisions are coming for whoever the coach is when training camp ends. After that Ben Walter with a two way contract and potential waivers. After that Joensuu who is a left wing seemingly blocked from any spot. Then there is Josh Bailey. Tim Jackman is on a two year/two way contract. Joel Rechlicz was signed for three years. Anyone who wants to add players have to subtract a few first. Seems Weight signed to play with Guerin, Comrie just resigned so unlikely they are going anywhere which leaves Mike Sillinger, Richard Park and Andy Hilbert. Park was signed last season for another two years. The poll on the left wings became a new record for this blog and immediatley after that the coaches poll hit triple digits, once again amazing turnout for a little blog in the middle of July and my thanks to everyone. Of course the poll was stated the day Nolan/Snow parted company but the Isles are not going to find someone named disgusted/numb but it was listed as an option to gauge sentiment but did lose a little steam after the first few days. I voted for Joel Quenneville eventually. I like the fact he has had a lot of success and is well regarded, a lot of the veterans here have long experience in the Western Conference. Boston Globe: Fluto Shinzawa notes the Newsday report about Scott Gordon being listed for an interview and adds Bruins GM Peter Chiarelli has repeatedly said he wouldn't stand in Gordon's way if he were offered an NHL head coach's job, so it's likely that the Bruins will allow the former goalie to interview with the Islanders if they come calling. THN.com: Adam Proteau's article asks why is Ted Nolan being demonized in some circles and insists this is nothing like his circumstances in Buffalo while getting the impression back in April Nolan would not be returning from his final interview with him but feels he should get another chance. I'm surprised Mr Proteau waited this long for his Islanders-bash fest (this was one of his milder ones) but he did put some blame on both sides without really giving us anything but personal speculation from what obviously is a distance to where what he writes has little value. Of course he does get right the gm having his way vs the coach needing to win now is not unheard of in sports but aside from that an article that tells us little because frankly he does not know anything. Sporting News/uncredited did a rip job on the Islanders for the last twenty years with a lot of old photos to make it's point in kind of a picture/caption rip job. SI.com: John Rolfe apparently followed up the twenty seven page caption with an article bashing the Isles for the last twenty plus years where he knew so little about the club he put Bergenheim in Fedotenko's spot as his replacement and put in his article Neil Smith resigned when he was in fact fired. So now the Islanders, a team that has been to the NHL playoffs four of the last six year are on par with sports clubs that have not seen a playoff or close to a five hundred record for a decade or longer? Not going to tell anyone here outside of 2002 the product has been anything but mediocre but this comes off as piling on and nothing else. Maybe Mr Rolfe is doing what he can to get the club out of here because the Rangers did not take that kind of beating over eight years nor did he write articles telling people to essentially stay home. Funny how St Louis, Florida, Phoenix, Los Angeles (who fired a coach hired the same summer Ted Nolan was hired) among others did not get this kind of article? John Rolfe usually does one of these a year on the Isles no matter what their record is. THN.com: Ken Campbell declares Paul Maurice is a front runner for the Islanders job because he is a good company man who will essentially do what the general manager says and not get involced in office politics. Paul Maurice according to Mr Campbell is now the front-runner for the Islanders coaches job? Seems like some of these writers throw anything against the wall hoping it sticks because no one else has written that anywhere and if that were the case the club would not be trying to interview so many potential coaches. It's summer not, much going on so it's time for the armchair experts who cannot name five Islanders to come out in droves. Islanders website: Jason Lockhart has an article on first round pick Josh Bailey which wraps up prospect camp with his comments as he looks ahead to training camp. Point Blank: Mr Botta decided to keep his blog going for a while longer and has a few words about what the club should be looking for in it's next head coach and takes a look at the current names scheduled for interviews. Ottawa Sun/several sources: Has more on IIHF suspending several players (including Nikita Filatov) from international competition which does not have the NHLPA happy given the recent agreement for all leagues to respect contracts already signed with other leagues. Montreal Gazette: David Yates reports on Mike Bossy taking part in the Chevrolet Safe and Fun Hockey program with women's national team star Caroline Ouellette and coaches from Hockey Canada with his comments.